It was in 2010 in St Petersburg that the incredibly talented and classically trained music students Marjana Semkina (vocals) and Gleb Kolyadin (piano) discovered their shared love for progressive rock and founded Iamthemorning, taking the name from an Oceansize song. Since then, the duo has had a successful career with a constantly growing fan base across the globe and three praised studio albums where their mix of classical music and sounds from Canterbury, folk and jazz has led to the tag “chamber prog”. Their latest album, the excellent “Lighthouse”, won Prog magazine’s Progressive Music Awards’ Album of the year award for 2016 and features King Crimson/Porcupine Tree drummer Gavin Harrison, Porcupine Tree bass player Colin Edwin, a vocal guest appearance by Riverside’s Mariusz Duda and was mixed by Tori Amos’ Marcel van Limbeek. Apart from his band commitment, Gleb just released his debut solo album which has been very well received and includes appearances by Steve Hogarth, Jordan Rudess, Nick Beggs, Theo Travis and many more. Although Iamthemorning is a duo on paper, it becomes a six piece band on stage, always with a focus on creating a melancolic and gothic feel with vibes from names like Porcupine Tree, Kate Bush, Riverside and Steve Hackett. 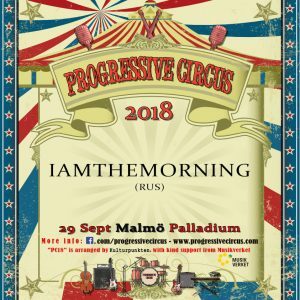 The band has played on major festivals and events like Be Prog my friend, Ramblin’ Man Fair and Marillion weekend convention, and this autumn, it’s time for their first Swedish concert at Progressive Circus 2018! On Palladium’s stage you will get the full Iamthemorning experience where Marjana and Gleb are complemented with drums, bass, cello and violin. Expect a stunning and moving show! DO NOT MISS!